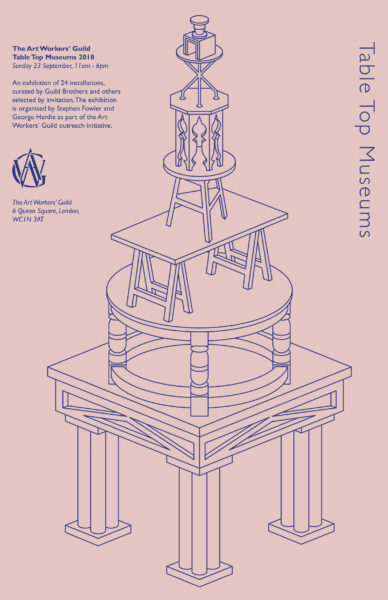 An exhibition of 24 installations, curated by Guild Brothers and others selected by invitation. The exhibition is organised by Stephen Fowler and George Hardie as part of the Art Workers’ Guild outreach initiative. From The Pataphysical Museum, two sets of postcards related to the topic of ‘amateurism’. ‘Priests’ consists of depictions of priests who, being forbidden certain activities, tend to be keen on ‘hobbies’; ‘Outsider art environments’ show astounding constructions, mostly now destroyed. Bob’s Big Boy was founded by Bob Wian in Southern California in 1936 and was a very popular hamburger restaurant in 1970s, which still operates to date. The collection of Bob’s Big Boy merchandise includes cufflinks, cards, tiepins, nightlights and other remarkable materials. Whether photographed, painted or drawn, the rough sea postcard has been an important, cheap entry in the genealogy of pictorial communication from the 1840s onwards. The Rough Sea Postcard Museum displays examples of the phenomena and illustrates its broader influence. This collection comprises an assortment of vintage clock parts, collage items and print ephemera. It provides inspiration for my art and my own ongoing enquiry into the concept of time within our world, past, present, and future. A re-created memory of a glass case, seen some forty years ago in a County Museum, which was so carefully dusted, and so often, that all the labels had gradually migrated until rendered meaningless. The museum contains a variety of plumes, from the tiny Jay feather, to the metre-long Giant Argus Pheasant tail feather. It also includes vintage hat feathers, a swan-down powder-puff and Bird of Paradise tail feathers. There are also dove, goose and turkey feathers hand-printed by Jewell with designs and images of birds. Like all humans I suffer from terrible consumption; but rather than cough blood into a lace hanky I drew furiously and candidly into A5 sketchbooks. Between 2001-2002 it was everything I ate, between 2004-2005 everything I bought. It’s probably very revealing. Oz Magazine was published between 1967 and 1973, and of all the British underground magazines and newspapers produced at that time it was the most colourful and outrageous. 48 issues were published featuring spectacular and experimental covers designed by the likes of Martin Sharp, Hapshash & the Coloured Coat, Barney Bubbles, David Wills, Jim Anderson, Felix Dennis, Pearce Marchbank and Richard Adams. Holidays are a chance to shop, often in junk shops, for old or quirky things as reminders of one’s travels. Some add to existing collections, others create new collections of their own. All tell a story. As the daughter of a dairy farmer I have always felt comfortable with cows. Cows are too big for urban life, so I collect their images. For this Table Top Museum I have arranged my collection under jokes, toys, posh pieces, practicalities, postcards and rustic nostalgia. The Gay Doll Museum incorporates 200 dolls mapping how gay sexuality filtered through to ‘mainstream’ culture in the last 50 years. Exhibits include pop stars, actors, and supporting characters from television shows; but here these peripheral characters are cast as stars. A collection of several hundred disposable ice-cream spoons collected from ice-cream parlours around the world. An attempt to create a Finnish Bread Tie calendar (in which bread turns stale) with every day of the year accounted for. This collection of clip-on plastic moustaches, quietly assembled over 40 years, demonstrates the full range of these cheap toys which come in a variety of shapes, sizes and colours. These small novelties are displayed loose – as if they’ve just fallen out of christmas crackers, in decorative retail packets and also in plain wholesale packages. On the sixth day of Creation, God made the animals. At the same time, the great architect made homes for them in styles that anticipated those that Man would re-invent later. He also put up a few monuments in advance. A self-confessed hoarder of junk, ephemera and information, Mandy will make a presentation of miniature installations of found objects which feature in her hand made book, Object of Desire. The collection is inspired by Mono no aware ( 物の哀れ, literally ‘the pathos of things’) a Japanese term for the awareness of impermanence, and a transient gentle sadness at their passing, alongside a longer, deeper sadness about this state being the reality of life. The Horse Hospital will display a selection of found objects, rarefied artefacts and ephemera from the archive. Featuring items of protection and posing, relics and religion, voodoo and veterinary accoutrements, through to the fetishised remains of human detritus. My extensive collection of mincers, never before exhibited. I have been collecting these unenthusiastically since 1983. Claire Fletcher & Peter Quinnell. Part of a proposed travelling exhibition of small but interesting objects from around our house. Over 200 breadboards dating from Victorian times to the present, and carved accessories such as knives and butter dishes, amassed by Rosslyn Neave over 35 years. Themes include harvest, weddings, jubilees and pilgrimages. When we read a novel we love, we redesign the covers and endpapers using old print techniques and rebind them as hardbacks. A labour of love, each book is entirely unique, part of an ever-growing collection and never for sale. This collection is a portrait of a marriage in painted and hand-worked Easter eggs given once a year. Eggs by Jane, a few by Stephen and one by Vita. Cabinet by Martin Grierson using Stephen’s wood (figured pear and pernambuco). Descriptive book included. A museum of 20th century turned, carved, bent and painted wood design and wood related articles. Featuring a continuous profile of Mussolini, a cigarette box by Gerald Summers, a Karamojong head rest, a Munich School box from the 1920s, as well as Scandinavian, Japanese, Dutch and Brazilian decorative and practical examples. Fragments from the recently leaked Church Commission for Pharmaceutical Initiatives archives, revealing unexplained events within installations and quasi natural features upon the remote Hallow Isles group in the Celtic Sea. A collection of individual Matchbox Museums – special collections in micro.